We are far from Valentine’s day, but that doesn’t mean love can’t be felt all over Colchester. Indeed, love is in the air. At least, it was for one couple in Colchester. 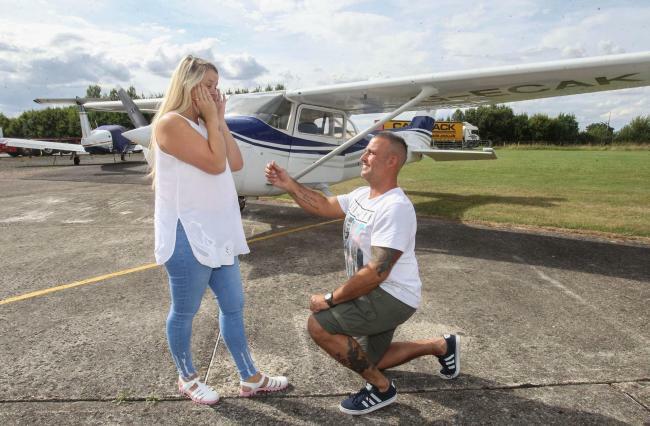 Glen Prentice took her girlfriend Rachel Last on board a plane at Earls Colne airfield. The plan was to ask Rachel’s hand for marriage. The couple have only been together for six months. But when Glen Prentice took the Essex skies, he just knew that proposing would be the right thing to do. Glen told Rachel that they were going to be doing a bungee jump to keep her in the dark. The couple are hoping to tie the knot within the year. “I wanted it to be memorable, something a little bit special that we could remember, rather than one of your more standard proposals. “I had been trying to think of a way to ask her for a while, but nothing quite seemed right, then I came up with this idea. Rachel, the 24-year-old bride-to-be said “To start with I was just relieved that he wasn’t making me do a bungee jump. “I never expected it at all, I was in complete shock. I still am in shock, I really was speechless, I still am speechless.